Global Accessibility to Cities 2015. Source: Weiss et al. Nature (2018). How long does it take you to travel to the nearest major city? What if you live far from even the nearest road? The answer to these questions will determine how easily you can access the many resources that a major city provides, from emergency health services to economic markets. Now turn the question around: if you’re going to build a new medical facility in a developing nation, where should you build it to best reach underserved populations? To help answer these kinds of questions, we teamed up with researchers at the Oxford Malaria Atlas Project, the European Commission’s Joint Research Centre, and the University of Twente to make a new map of accessibility to cities worldwide. 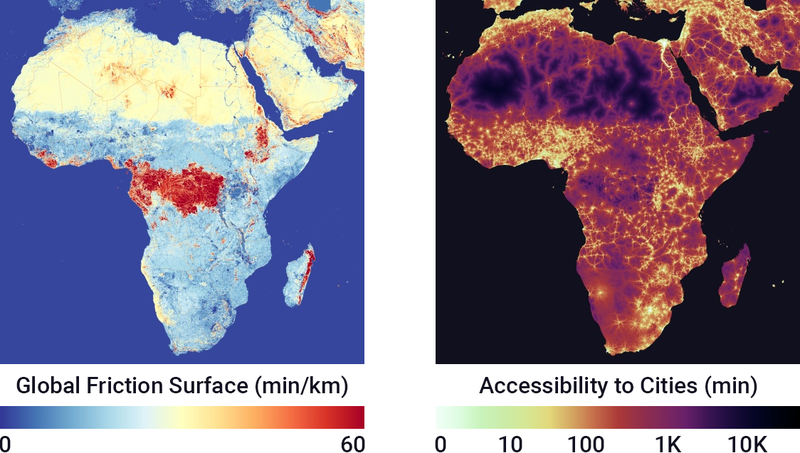 Published along with a journal article in Nature that describes this work in more detail, this new map estimates the travel time from every point on land to the nearest high-density urban center, as a proxy for accessibility to a wide range of urban resources. Researchers and policymakers can use this map to help study topics ranging from global public health to urban growth and the economic drivers of agricultural change. In Hawaii only Honolulu, on the island of Oahu, is considered a high-density urban center in this study. As an example, let’s consider accessibility to hospital services in my favorite vacation destination, Hawaii. In the global study, only the city of Honolulu meets the criteria of a high-density urban center. You can see this clearly in the image above: the island of Oahu pops out because all other islands are far from a major city. Instead, let’s make a map that reflects the hospitals in other smaller communities in Hawaii, too. To quickly make our customized map we can use Earth Engine, Google’s cloud platform for geospatial data analysis and visualization. Both the Accessibility to Cities data and the Friction Surface are available in the Earth Engine data catalog for you to easily use. For this example we can start by using Wikipedia’s list of hospitals in Hawaii to make a table of the locations of major hospitals. Then it only takes a few lines of Earth Engine script to load the global friction surface and compute the total travel time from every point to the nearest hospital. You do this using Earth Engine’s cumulativeCost() function, which we originally added to support this collaboration. 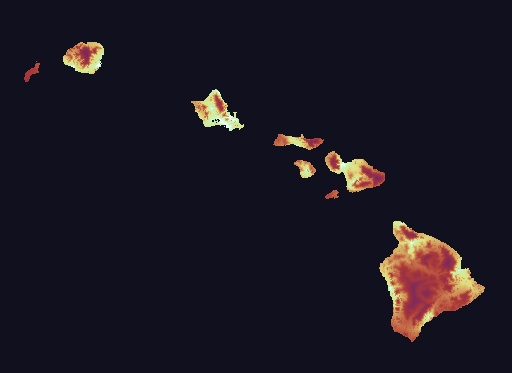 A custom map: approximate travel time to hospitals in Hawaii (darker is longer). The result is a customized map of accessibility to hospital services in Hawaii that more accurately reflects accessibility to these services in this region. Of course, if you’re stuck in the middle of the wilderness then it’s still going to take you a while to get to a hospital!